Set for release Dec. 1, the History of Beverly Willard Family of Virginia and Tennessee chronicles 250 years of American history as told through the descendants of one man, Beverly Willard, who was born in the mid-1700s and lived in Virginia until his move to Middle Tennessee in the early 19th Century. Five years in the making, the publication is the collaborative effort of 50 contributors, crossing 13 generations and containing the names of more than 8,000 of Willard’s descendants. However, Nichols assures that the book is far more than traditional genealogical offerings, calling it “a true-to-life adventure,” supported by more than 200 pages of vintage photographs and hundreds of documents, letters, bible records, personal stories and newspaper accounts. American history comes alive through stories of one young man who gave his life in 1814 at the Battle of Horseshoe Bend; brothers on opposing sides during the Civil War; a mother who defied a Union officer’s attempt to steal the family meal; a duel in Auburntown, Tenn., and the 40-year feud that resulted; 15 children and their parents who braved the wild West on a wagon-train to settle Texas; a young Texas Ranger murdered in the line of duty; a 95-year-old woman who became a legend in her hometown; and countless other stories of regular people living ordinary – sometimes extraordinary – lives. Nichols observed that technology was crucial to the process and successful completion of one of the most comprehensive family histories written relative to Cannon County. Nichols submits that contrary to what many think such new technologies have brought families closer. “It was through the use of the Internet that cousins began to find one another and seek answers about their ancestry,” he said, crediting a “pool of inquisitive cousins” with the idea of coordinating individual efforts toward a common goal of updating the original work. A private, invitational-access Internet website was created for correspondence among interested group members, with as many as 50 people in 16 states and one foreign country involved. 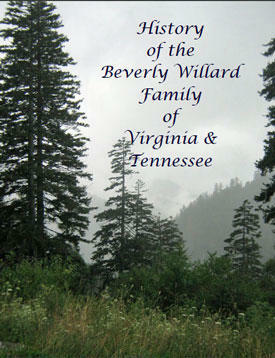 The History of the Beverly Willard Family of Virginia and Tennessee is being presented on DVD in two volumes in the .pdf format readable by all computers and mobile devices. It may be purchased through Dec. 1 at the pre-publication price of $25 (no shipping/handling) or after at $35 per copy. Orders are filled upon receipt at 1565 Main Street, Lynnville, TN 38472. “The purchaser may view the DVD on a computer, choose to print the publication on a home printer or take the camera-ready files to a professional printer for creation of a book,” Nichols said, adding that 14 different covers were designed to offer choices in personalizing final printed edition.